I am spending the summer at Lehigh University in Bethlehem, Pennsylvania. I am working on my EdD. in Educational Leadership. Last night I had a lot of reading to do so I went to the baseball game to get it done. Baseball (and cricket) are the perfect sports for reading while at the park. The “Iron Pigs” are a minor league baseball team. The minor leagues are the developmental teams for Major League Baseball (MLB). Every MLB team has several levels, leading up to their big league team. 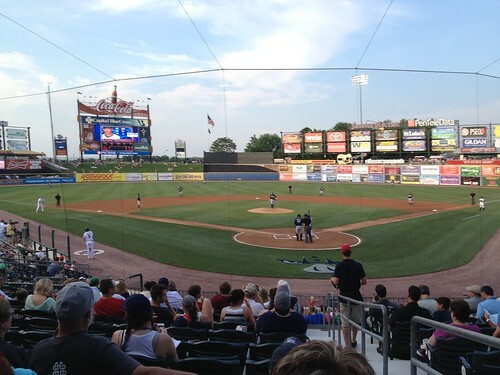 The Iron Pigs are the top level (AAA) affiliate for the Philadelphia Phillies. They were playing last night against the Tampa Rays top affiliate in the “International” League. I don’t know why they call it the international league because all of the teams are located in the eastern and central part of the US. All of the players are just one step from MLB and so the level is quite high, but most of them will not make it to the top team. There are about 800-1000 players in the MLB and about 5,000 minor league players. I would estimate about a third of the players at AAA get at least a game or two with the MLB club. I was very impressed with the stadium and the large crowd (approx 10,000) people on a beautiful summer evening at the ball park. Americans do know how to make money from professional sports and I wish Red Star and Partizan could come and see what a stadium experience should be like. They were super organized with parking attendants, ushers, and security guards who were friendly and efficient. The experience is designed for families and for extracting money from the patrons. There are restaurants, fast food, really nice beer gardens, BBQ areas, and even a bouncy castle park for kids. In the outfield they have a grassy hill for picnicking. The souvenir shop was also first class and making a brisk business. In between innings they kept the fans entertained by giving away free t-shirts, a bunch of audience participation games, even a mascot running race. Unfortunately, the home team lost 3-1, but more importantly for me, I got three chapters read of my homework and I enjoyed working in the relaxing environment of the baseball park. I am interested in the finances of the team. I wonder if it is a profitable business?